S.A.F.E Structure Designs — a global leader in the design, engineering and manufacturing of ergonomic safety-first aircraft maintenance stands, fall protection platforms, hangar equipment, portable field equipment and specialty tooling — has announced that it has successfully satisfied its contract for the custom design, engineering and manufacturing of safety-first, ergonomic Bell 429 maintenance stands for the Nassau County Police Department (NCPD) in Bethpage, New York. S.A.F.E. 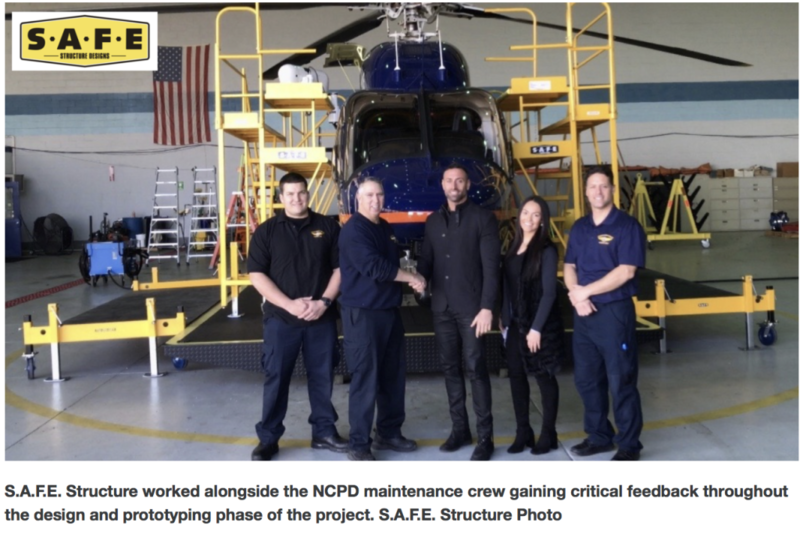 Structure has pioneered the way for developing a complete ergonomic, safety-first custom maintenance stands and hangar equipment specific to the Bell 429. The first set of prototype stands were delivered in January 2017, at which S.A.F.E. Structure conducted a thorough test fit to inspect all aspects of the designs to further optimize safety and ergonomic concerns. S.A.F.E. Structure then made enhancement modifications to the stands, and now the final product line is out on the market. S.A.F.E. has recently added a custom proprietary anti-fatigue mat to the deck of its maintenance stands and platforms to protect the mechanics’ ankles, knees and backs along with an F.O.D. waist can to increase efficiency by providing a more ergonomic work space. These two innovative additions are included as a standard option in every maintenance stand and platform manufactured by S.A.F.E. “S.A.F.E. Structure customized maintenance stands for the NCPD’s Bell 429 aircraft — a job well done! They followed up to completion and satisfaction. Thanks Johnny Buscema and Jenna Hoeg,” said Officer Thomas Verga of Nassau County Police Departments.